Forty years after the fall of Saigon, Washington is still pursuing the same policies that led to the worst defeat in American military history. We never acknowledged, let alone learned, the lessons of that misconceived campaign to “roll back Communism” in Southeast Asia, thus setting ourselves up for endless repeats – in Iraq, Afghanistan, and now, perhaps, Iran. Just as today’s “war on terrorism” is portrayed as a “generational” struggle against “radical Islam,” so the Vietnam war was an episode in a cold war saga the end of which no one could see. The Soviet Union was presented as Satan with a sword, a mighty enemy sworn to our destruction, whose agents had subverted every country worth conquering and were homing in on the American homeland – unless we acted to stop them. The reality, however, was quite different. Soviet socialism had struggled to survive ever since the Bolsheviks seized power in a 1917 coup, and only endured World War II due to massive Western aid and US intervention in the conflict. Even before the end of the war, which decimated Russia, the Kremlin had been forced by necessity to make its accommodation with the West, formally giving up the much-cited Communist goal of a world revolution against capitalism in favor of “socialism in one country.” Unable to feed its own people, let alone conquer the world, the ramshackle Soviet empire could hardly keep a hold on its eastern European satellites, facing rebellions in Hungary, Poland, and Czechoslovakia before the final implosion in 1989. Such gains as the Soviets made were accomplished either with outright Western complicity – Eastern Europe was handed over to “Uncle Joe” at Yalta – or else due to the stubborn incompetence of the US and its allies. While what was then called the “Third World” was throwing off the chains of colonial rule, Washington sided with the colonialists – in Vietnam, this meant the French, who were aided (in limited fashion) by Eisenhower. President Kennedy had none of his predecessor’s caution, however, and he leaped into the fray, declaring we would “pay any price, bear any burden” in the struggle against the Communist Menace. His administration took the first step down that fateful road, supporting the unpopular and repressive South Vietnamese regime and sending in hundreds of US “advisors” – who were soon doing much more than advising. Then, as today, the Enemy was depicted as a vast centrally-directed conspiracy: according to our “experts” and the pundits, the Vietnamese communists were mere puppets of the Kremlin, and the battle there was yet another chapter in the story of the reds’ relentless campaign for the West’s destruction. 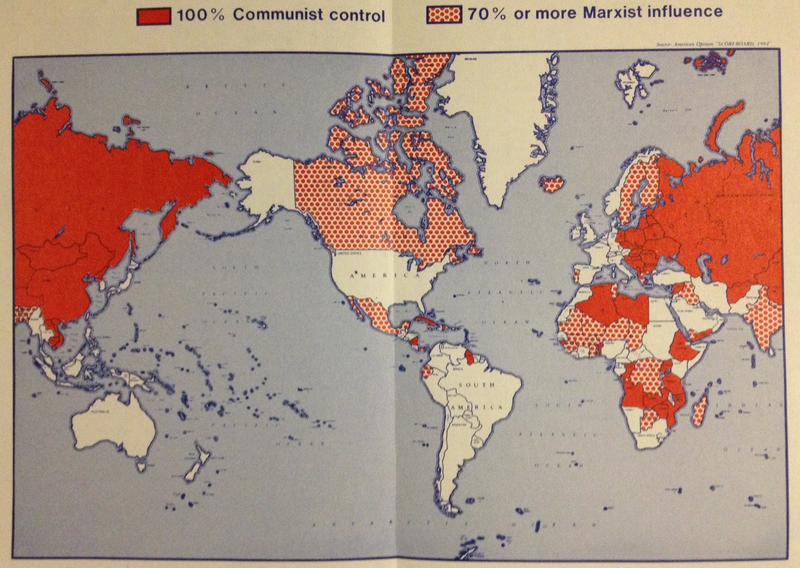 This cartoonish view overlooked developing splits within the international communist movement, and – crucially – the key role played by rising nationalism in communist successes in the developing world. When it came to Vietnam, the Soviets were far from unconditionally supportive of the native communist movement. Having given up the goal of world revolution in favor of seeking détente with the West, the Kremlin continually acted as go-betweens pursuing a diplomatic settlement of the Vietnam conflict. As early as 1956, the Soviet party sought to rein in the Vietnamese Communists who were contemplating resumption of a military campaign to reunify the country. The US and its allies were ignoring the Geneva agreement to hold elections – which was denounced by then Sen. John F. Kennedy – and they aided South Vietnamese strongman Ngo Dinh Diem in his efforts to consolidate his hold on the South. The brutality and outright stupidity of the American campaign in Vietnam was the communists’ main weapon: as the Americans destroyed villages in order to “save” them, the populace turned to the Viet Cong and their North Vietnamese allies for protection. The Americans were seen as foreign occupiers, the heirs of the French who had lorded over the region in similar fashion: the corrupt and brutal “Republic of Vietnam” was widely hated by its own citizens. The Vietnamese were fighting on their own land against foreign troops and native collaborators: it was a war the Americans could never win, not if they had stayed there for a hundred years. The parallels with the present are all too obvious. In Afghanistan, we face a similar enemy: native guerrillas fighting against foreign occupiers and a puppet regime that has the allegiance of only those who can be bought. The Taliban is the Viet Cong of our era: supposedly directed by an international “radical Islamist” conspiracy, it is in reality a local phenomenon motivated not by ideology but by the natural opposition encountered by any occupying army. The same goes for our ill-fated attempt to subdue Iraq, where nationalism and not any religious-ideological belief system is what motivated resistance to the occupation and ultimately drove us out. Keeping in mind the question of scale: just as US intervention on the Soviet Union’s behalf during World War II delivered them half of Europe, so US intervention in Iraq effectively handed the country to the Iranians. Now we are told that a regime we empowered is the main threat to peace in the region. Similarly, such gains as Al Qaeda has made are due, in large part, to our own actions. As our Saudi allies invade and decimate Yemen with Washington’s full support, the heirs of Osama bin Laden are expanding their foothold amid the ruins and the misery. In Libya, where we overthrew a secular tyrant at the behest of our European allies and our own “humanitarian” interventionists, Al Qaeda is now cavorting in what was our embassy swimming pool. In Syria, where US support to “moderate” Islamists is weakening another secular tyrant, Al Qaeda and its allies are consolidating their hold. And ISIS, the latest bogeyman to haunt our fever dreams, is the mutant offspring of George W. Bush, Donald Rumsfeld, and the neocons who took us to war in Iraq on the basis of a lie. The lessons of Vietnam, and of the cold war generally, haven’t been learned by our political elites for the simple reason that they don’t want to know about anything that contradicts their dogmatic worldview. That conception of how the world works is rooted in their own little careers, and the colossal conceit that is the hallmark of elite culture in this country. They live in an ideological bubble, one that punishes truth-telling and rewards conformity – and nothing is more obligatory in the world of Washington than to pledge allegiance to the delusions of a political class that believes it can do anything and get away with it. The same policymakers and pundits who ginned up the disastrous war in Iraq have lost none of their power and prestige: we live in a political culture that rewards failure and comes down hard on anyone who strays outside the Washington consensus. The US hasn’t won a major war since the end of World War II: Korea was a draw, Vietnam a humiliating defeat, Iraq was an American rout, and Afghanistan is a quagmire that is slowly draining the lifeblood out of our military. The only successes we’ve had is when we picked on a country as small and defenseless as Panama, Grenada, or Serbia. As we push our way into every local conflict, internationalizing it and blowing it way out of proportion – e.g. Ukraine – this is worth bearing in mind. The supposedly mighty US empire, like its Soviet predecessor, projects the illusion of invincibility and permanence, while an inner rot eats away at its core. That rot is the cancer of debt, corruption, and a cultural nihilism which threatens the very values that made America an economic powerhouse and the envy of the world. As our leaders preen and pose on the world stage, as we bully our way into every local conflict, braying that we embody the concept of “world leadership,” and demanding that lesser nations follow Washington’s diktat, the mirage of our global hegemony is dissipating. Can we control events in Kabul if we can’t even keep a firm grip on Baltimore? One day the distance between the conceited ranting of our political leaders and the pathetic reality of a country in terminal decline will become so apparent that not even the Washington know-it-alls will be able to deny it. By then, however, it will be too late for anyone to do anything about it. The Soviet Union disappeared in a matter of a few weeks: one wonders if it will take that long when it comes our turn.